In 2014, I designed Essence of Australia for Royal Botanic Gardens Victoria at the RHS Hampton Court Palace Flower Show that won a Gold Medal as well as the Tudor Rose Award for Best in Show. 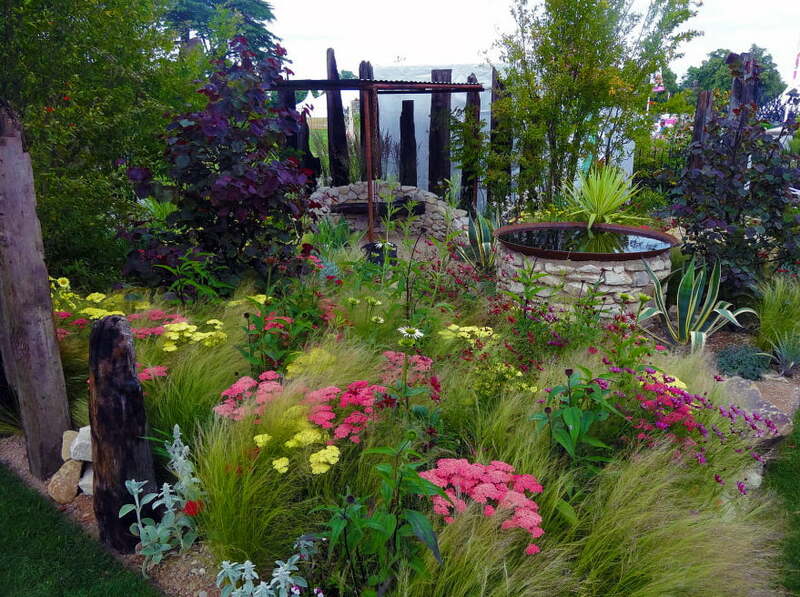 Hampton Court is the largest flower show in the UK and renowned for its edgier and more contemporary gardens. 1.Chelsea is very early in the season and often experiences very cold and wet weather. The problem is that it can often be too early for spring and summer flowers. Hampton Court is during summer and often experiences warm to hot sunny days with blue skies, something more akin to Australian weather and certainly much better for summer perennials. Garden influences at Hampton Court are wide ranging and often more relevant to climate and gardening style. 2. Size & Space. Hampton Court is the largest annual flower show in the UK. And arguably it is the largest annual flower show in the world in terms of area, number of exhibitors and attendance. Hampton Court is the UK’s second major national show after the Chelsea Flower Show but has its own unique character, focusing more on environmental issues, growing your own food and vegetables, and offering opportunities to engage with exhibits and to buy plants and gardening products (which you can’t do at Chelsea). The grounds of Hampton Court stretch over 34 acres with more than 600 exhibits. At Hampton Court you are not jostling shoulder to shoulder to see exhibits. Everything is more leisurely. You can sit and picnic on the grass, sit in the shade of trees, and take in exhibits in your own time without queues. Luxuries not often afforded at Chelsea. With more space than RHS Chelsea, RHS Hampton Court offers more interactive displays. 3.Owing to more space, Hampton Court puts less controls over gardens, so you will enjoy a greater variety of garden styles, sizes, shapes and heights of exhibits (Chelsea has many controls over gardens). Hampton Court often features well-known designers such as Andy Sturgeon who created a garden in 2017 recycled from materials at the Chelsea Flower Show, but you will also find young cutting-edge designers starting to carve out a career with a fresh approach to garden design. 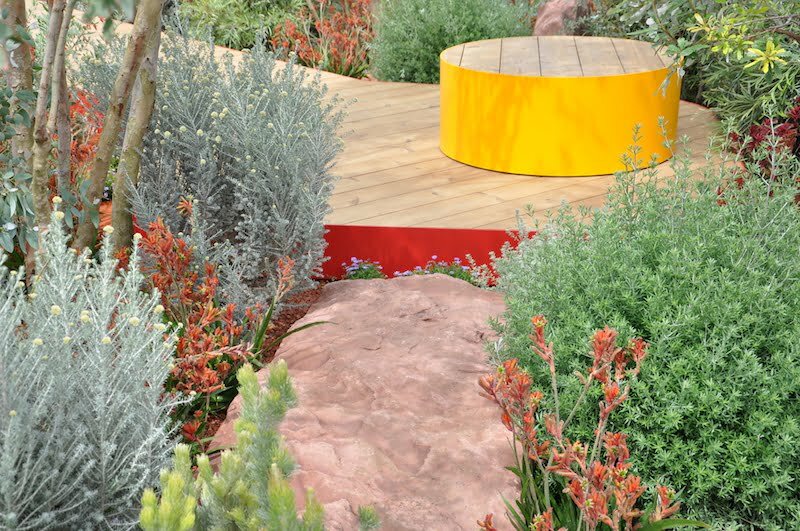 Hampton Court has a wider range of garden categories including Conceptual Gardens which are edgy artistic statements and very popular additions to the show. The Lifestyle Gardens are ideal for visitors wanting ideas to take home. The RHS is committed to inspiring new talent and encouraging more young people to pursue a career in horticulture and this is evident at Hampton Court. In 2018 the RHS introduced a new initiative to celebrate internationally-renowned individuals in horticulture, with the first Horticultural Hero being Piet Oudolf. Who will be the 2019 hero? 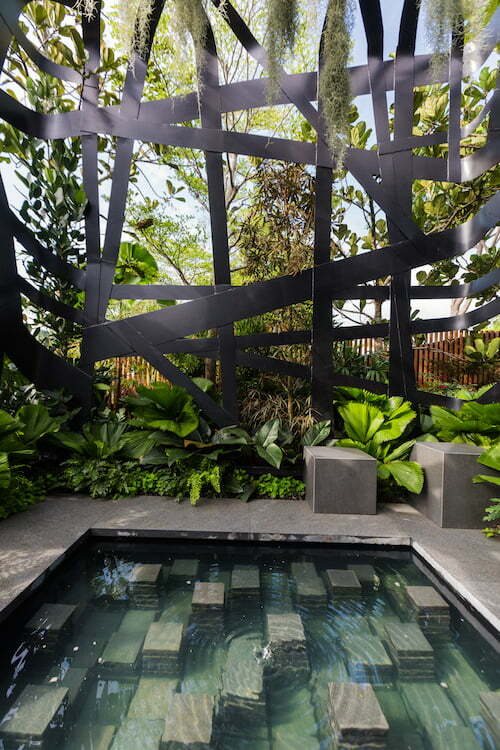 At the Singapore Garden Festival 2018, I collaborated with Andy Sturgeon on this garden called ‘Immersion’ that was a warded a Gold Medal as well as the Award for Best Construction. We will explore more about what inspires Andy Sturgeon’s designs on my tour to England in 2019. 4.Atmosphere & Facilities. There is no doubt there is a much more relaxed atmosphere at Hampton Court and it shows in the garden designs. Chelsea has restaurants and food outlets, but at Hampton Court you can enjoy them. At Hampton Court there is a wide range of food offered including food trucks and spacious bars and relaxed areas to enjoy yourself away from crowds. You can literally spend the day there. 5.Chelsea is in the heart of London which creates an amazing buzz, but Hampton Court is out of the city in the beautiful grounds of Hampton Court Palace. The show is located on the North and south sides of the Long Water in Hampton Court Park, with the Palace forming an incredible backdrop to the show. The fireworks on Gala Night is one of my all-time favourite garden show experiences. For the first time, I have joined with ASA tours to lead a tour to RHS Hampton Court Palace Flower Show in 2019. But visiting Hampton Court is only part of it. We have worked really hard to create a completely new tour of English gardens that reflect not only my passion of contemporary design but to also explore a new style of design emerging from European garden designers. In the last decade, gardening has changed in England. Well known European designers have been looking outward for inspiration to reflect the changing lifestyle of clients but also the changing weather patterns that English gardens are experiencing. There has been a huge shift from the expected formality and rigidness of English gardens to a more evocative natural style of design, in some cases reflecting inspiration from the natural world and sometimes exuding flair and outward personality through design, use of plants or sculpture. Jim Fogarty is an award-winning landscape designer (Jim Fogarty Design ) and gardening media personality, with an extensive knowledge of contemporary garden design. Jim's awards include a gold medal at the RHS Chelsea Flower Show 2011 & Gold & Best in Show at the RHS Hampton Court Palace Flower Show 2014.